Nehru visiting Bhakra - Source: NEHRU MEMORIAL MUSEUM AND LIBRARY. Nehru visiting Bhakra and calling it "Nation's pride"
The Bhakra-Nangal multipurpose dams are located in the state of Himachal Pradesh and named after the two dams built at Bhakra and Nangal on the Satluj River. The project comprises of (i) two dams at Bhakra and Nangal, (ii) Nangal Hydel Channel, (iii) power houses with a combined installed capacity of 1,204 megawatt (M.W.) (iv) Electric transmission lines and (v) Bhakra canal system for irrigation. It is one of the earliest river valley development schemes undertaken by India after independence although the project had been conceived long before that, in the early 1900s. The government of India strongly backed the project in order to make Punjab and Haryana the granaries of the nation and for ensuring water storage and energy generation. A secondary reason was the prevention of floods in the Sutluj-Beas river valley. The project has also been an important factor in the inter-state dispute between India and Pakistan, ultimately resolved with the Indus Treaty in 1960, under the aegis of the World Bank and and with the benevolence of the USA. Many years after its construction, the project is still highly contested by movements because it has never met the original objectives while it has caused severe social and environmental damages and losses. In April 2005, a three year study by Manthan Adhyayan Kendra  was presented and shaked politicians and supporters of dam industry in India. Among the main findings, the report proved that: - Despite he mainstream discourse pushed out by the government and mainstream science praising Bhakra complex for the agricultural boom of Haryana and Punjab, the sudden rise in agricultural output was mainly due to chemical inputs of the Green Revolution, which now leaves the soil deteriorated and has made the costs of production unaffordable for common people. - Bhakra did not add any new areas under irrigation, but rather transferred or shifted irrigation from one area to another - The figures of areas irrigated by the Bhakra project were highly overestimated and Bhakra itself was over-designed. (It was even found that water from the Sutlej was insufficient to fill up Bhakra, so water from the Beas was diverted to Bhakra through the Pandoh dam and the Beas Sutlej Link Project. Even after this diversion in 1977, the Bhakra dam has rarely filled to capacity . - At the time of planning and construction, no alternatives have been considered by the government, although many were there on the table Critiques to Bhakra include the fact that resettlement schemes have not been properly implemented and have been carried out under violence and coercion. Bhakra submerged around 18,000 ha of land and displaced more than 370 villages. The number of people affected is hard to define. 36,000 land owners had their land affected but nobody knows about the rest of the people. Siltation and soil erosion have reached alarming levels and the situation is quite impossible to restore. What should be questioned is the belief in overexploitation of water resources for increasing agricultural yields and the absolute need for more larga dams and water infrastructures. Due to the rapid changes under the "Green Revolution", most of the Sutluj water does not reach the sea but is diverted to fields and sometimes accumulated underground, causing water logging, and soil quality is very poor, making farmers depend on chemicals. SANDRP reminds that "According to ‘India Irrigation Options Study', done for the WCD, the total gross contribution of lands irrigated by all large dams in India comes to only around 10%. The net contribution (net of lands lost to dams, net of potential contribution of these projects without large dams, etc) would be much less. Unfortunately, the government has never bothered to assess the performance of its own large projects." Manthan centre's study reports that villagers were initially understanding and accommodating with the government, even if this caused them serious distress and hardships. The faith in the authorities and their developmentalist agenda eroded with years passing by, as they realised they paid a much higher price for no real benefits at all and their suggestions and proposals were not taken into account. Still today, Bhakra complex remains a symbol of a blind faith in big infrastructure solving all problems, of the race to rapid increase of production for meeting the nation's need. But also a symbol of its failing, and the urgent need to implement existing alternative proposals and redefinition of development. Project Details The Bhakra Dam is one of the highest straight gravity dams in the world. It has been constructed on the Satluj at the site of Bhakra gorge near Rupnagar (Ropar). The dam is 226 metre high and 518 metres long with its maximum width at the base as 362 metres. The dam has created a huge reservoir of water which is 88 km long and 8 km wide with a storage capacity of 986.8 crore cubic metres. This reservoir is named as Gobindsagar Lake after Guru Gobind Singh, the tenth guru of the Sikh community. 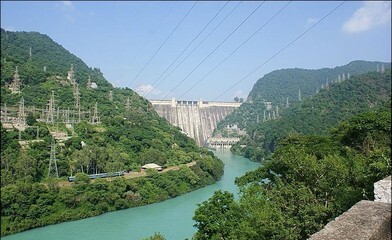 The Nangal Dam has been constructed at Nangal about 13 km downstream of the Bhakra dam. This 29 metre high, 305 metre long and 121 metre wide is an auxiliary dam which serves as a balancing reservoir for taking up daily fluctuations from the Bhakra Dam. The Nangal Hydel Channel is 64.4 km long, 42.65 m wide and 6.28 m deep canal. It has been cemented throughout its length to avoid seepage. It is one of the longest cemented canals of the world. It takes off from the left bank of the river and flows through pigged topography of steep slope. There is a fall of 70 metres in elevation within a distance of 64 km. Its main function is to turn the turbines of power houses located below the Nangal Dam but it also supplies water to the Bhakra irrigation canals. Power houses have been built to generate hydroelectricity from water of the Satluj River. One power house has been built at Ganguwal about 19 km downstream from Nangal. Another power house has been constructed at a distance of 29 km from the Nangal dam. This is known as the Kotla power house. The Ganguwal and the Kotla power houses have 2 units of 24 MW each and one unit of 29 MW. The third power house is at Rupnagar. Two power houses have been constructed at Bhakra dam, one of which is on the left and the other is on the right bank of the river. The installed capacity of these two power houses is 450 MW and 600 MW respectively. The main Bhakra Canal is 174 km long. The length of the canal system and that of the distributaries is 1,104 km and 3,360 km respectively. This canal system commands a gross area of about 27 lakh hectares and provides irrigation to about 15 lakh hectares. Of this 37.7 per cent is in Punjab, 46.7 per cent in Haryana and the remaining 15.6 per cent is in Rajasthan. Transmission Lines have been laid to carry hydroelectricity to the consuming centres. A total of 3,680 km long transmission lines are used to supply power to many major and middle size cities, including Delhi. Development of Alternatives Changing of agriculture patterns in the area, rethinking the development paradigm and application of the compensation measures to the affected people. Why? Explain briefly. Although the Bhakra Nangal project has contributed to the irrigation schemes and to an increase of agricultural production, it is the whole pattern of industrial agriculture to remain problematic. Moreover, compensation and rehabilitation schemes have not been properly implemented and even 50 years after the beginning of construction many issues remain to be solved. The faith in large infrastructure and developmentalist ideas needs to be urgently questioned and smaller scale alternatives implemented. Nehru visiting Bhakra Source: NEHRU MEMORIAL MUSEUM AND LIBRARY. 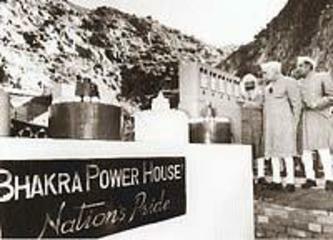 Nehru visiting Bhakra and calling it "Nation's pride"
Other Comments (*) This number refers to land owners; landless people have not be counted and are very difficult to estimate.